I am told that my impression of the silver treasure may interest you.See letter of January 7, 1927 . I am giving it sous réserve expresse“Expressively subject to.” of the opinions of those wiser than I am. When Royall came to call me to see the treasure he warned me that it had all been washed with acids, and looked brand new. My eye was prepared, and I was not shocked by the white look of the objects. I did not examine their surface to discover the alterations produced by the acid. I saw traces of discolouration on one of the chalices,—faint yellow marks supposed to be traces of dissolved gilding. I did not mind these. It seems to me that the eye is carried beyond the superficial accidents that have befallen the metal, and is held by the intrinsic character of the objects. 1) The candlesticks.Pair of Lampstands, Walters Art Museum, Baltimore, acc. no. 57.634-635. Very very beautiful, elegant, and very suggestive in view of their probable date. 2) Silver ewer.Ewer, Walters Art Museum, Baltimore, acc. no. 57.645. Unique as far as I know, particularly interesting for the same reason as the candlesticks, and very pleasing to the eye. 3) The dishes.Paten, Walters Art Museum, Baltimore, acc. no. 57.643; Paten, Walters Art Museum, Baltimore, acc. no. 57.644; Large paten, Walters Art Museum, Baltimore, acc. no. 57.637. They offer no special challenge, but I consider them fine. 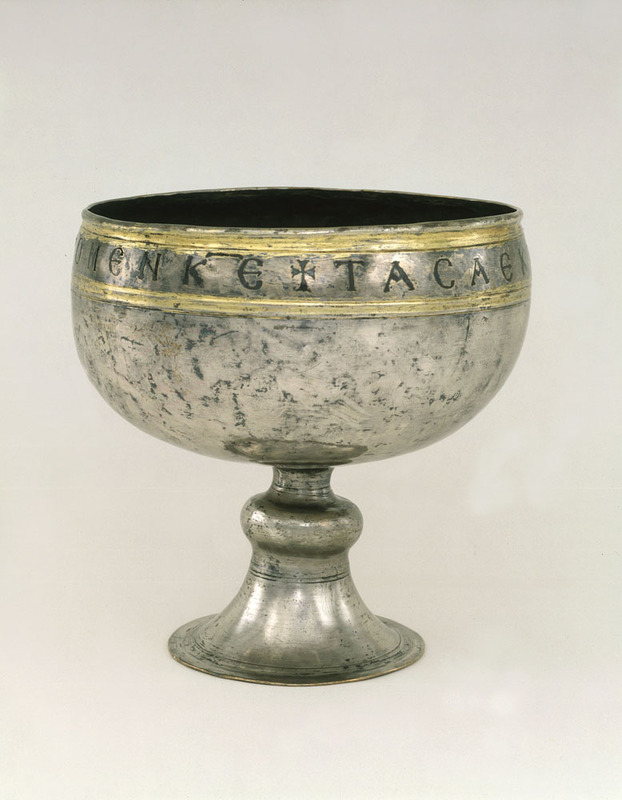 4) Plain Chalice with inscription.Chalice, Walters Art Museum, Baltimore, acc. no. 57.642. I feel I cannot judge it fairly with our chalice in my mind’s eye. It is in better condition than its brotherSilver chalice from the Kaper Koraon treasure, British Museum, London, M&ME 1914, 4-15,1. in the British Museum. It has grace, and perhaps nobility, but as I say, it is not comparable to the Riha chalice, in style and quality. 5) The bucketLamp, Walters Art Museum, Baltimore, acc. no. 57.640. looks commonplace and rather vulgar. It is a stolid object, but considerable in weight and size. 6) The small box.Eucharistic Box or Reliquary, Walters Art Museum, Baltimore, acc. no. 57.638. Very attractive, in excellent condition and interesting. 7) The small bowl.Silver cup, Walters Art Museum, Baltimore, acc. no. 57.631. Very attractive minor piece. 8) The Crosses. Thin and delicate, the larger crossProcessional or Altar Cross, Walters Art Museum, Baltimore, acc. no. 57.632. seems to me beautiful, one of the others (with beads)Processional or Altar Cross, Walters Art Museum, Baltimore, acc. no. 57.641. very attractive. 9) The spoonsSpoon, Walters Art Museum, Baltimore, acc. no. 57.647; Spoon, Walters Art Museum, Baltimore, acc. no. 57.648; Spoon, Walters Art Museum, Baltimore, acc. no. 57.649; Spoon, Walters Art Museum, Baltimore, acc. no. 57.651. are all, severally and collectively interesting and attractive. The large ladleLadle, Walters Art Museum, Baltimore, acc. no. 57.646. is to me particularly and subtly attractive. 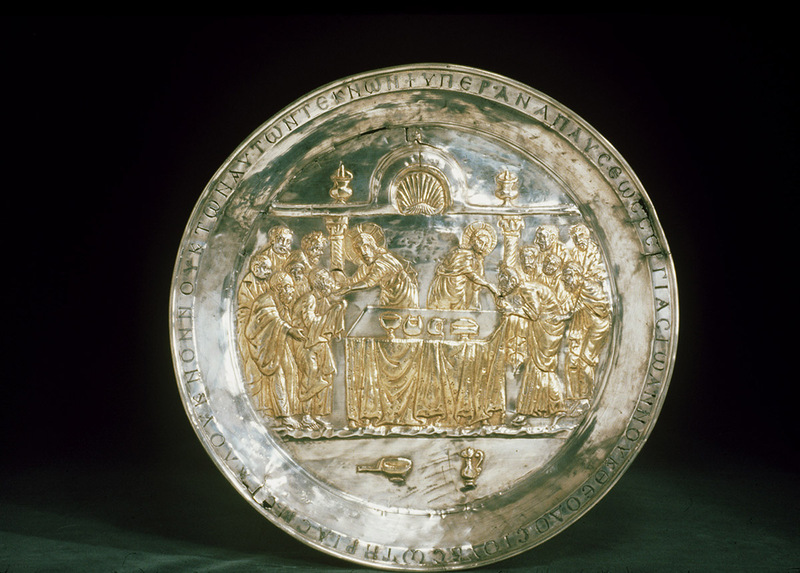 10) In all the repoussé silver work, the execution, and the quality of the design is so far inferior to your lovely paten that I cannot judge them fairly with it in my mind’s eye. The gap between them and the quality of the average silver box, capsella, etc., in museums or church treasures—(there are not so many)—seems to me narrow, and that between all of these and your paten very wide. The bottle for the chrismOil Flask, Walters Art Museum, Baltimore, acc. no. 57.639. is much larger than you would expect from the reproduction in “Syria.”Charles Diehl, “Un nouveau trésor d’argenterie syrienne,” Syria 7, no. 2 (1926): no. 10. This object is venerable, but not specially beautiful. I append an imaginary valuation intended to give you my idea of the price I should expect to be asked if these objects were offered singly by any one of the good dealers in Paris to-day. *When I think that Mallon asked 4000 for the little blue coat,Although in a later letter of March 14, 1931, Royall Tyler states that this textile is in the Smithsonian Institution, Washington, D.C., it is a tunic inscribed with the name of the Buyid Bahāʾ-al-dawla, ca. 1000 CE, from the Naqqāraḵāna of Ray, which is now in the Textile Museum, Washington, D.C., acc. no. 3.116. See Arthur Upham Pope, A Survey of Persian Art, from Prehistoric Times to the Present (London: Oxford University Press, 1938–1939), 3:2009, 2031, no. 12. See also letters of November 22, 1926; November 26, 1926; November 30, 1926 ; December 21, 1926; and May 3, 1927. I feel that 2000 is much too little for these candlesticks.